The classical mandolin class (which is one of the 43 classes on Artist Works) offers 191 lessons: quite a curriculum! In each lesson we find at least one video, sometimes more. Each video is three to six minutes long. We really start from the beginning: a brief history of the mandolin, its shapes and styles. And then the variety of strings, picks, how to hold the instrument and to tune it. Quite early on we start learning the different ways of picking, how to pick on each string, how to play " piano " and " forte ", etc. For most of the lessons we can download sheet music and play along tracks with an audio accompaniment of the melody we are learning. There's also a metronome to assist us in our practices. The lessons progress very gradually: we start by playing whole notes on open strings and, at the end, we should be able to play Salvator Leonardi 's Souvenir de Sicile or Calace's Boléro op. 26. Of course, we don't play a new piece every lesson; some lessons are just plain explanations, in some of the others we play on open strings only, in others, we play by ear, etc. Quickly, I have counted 127 pieces from 31 different composers. Favorite composers go as follows: 22 pieces from Leone, 19 from Calace, 11 from Pettine, 11 from Branzoli, 8 from Cristofaro, 7 from Mazas. Not really surprising: these are the main composers of method books for the mandolin. But we also find pieces from Bach, Brahms, Bartok, Mozart, Schubert and Beethoven. The composers from the XVIIIth century occupy a very large place in these lessons: Leone, Fouchetti, Denis. This is no coincidence. We must not forget that Caterina Lichtenberg holds the only existing professor position for classical mandolin through the Music Conservatory in Cologne, Germany and that she was the student of Marga Wilden-Hüsgen. The latter is the author of the Mandolinen-Schule, "the first clear exposition of the modern German technique" ( Paul Sparks, The Classical Mandolin, Clarendon Press, p. 167). So we should expect that Caterina Lichtenberg's teaching reflects the importance of this very distinctive technique. By the way, the first introduction lessons follow precisely the structure of the famous method book: we can find 11 pieces from it in Caterina Lichtenberg's "Beginner" section. Roughly, what we call "the modern German technique" is mainly about how the right hand works on the instrument: the pick is held either at 45o or 90o. So, not only does it allow usual downstrokes and upstrokes, but we can also perform downstrokes with the pick held at 45o, hitting two strings while going down and one string while going up; with the pick held at 90o both strings are struck alternatively with downstrokes and upstrokes; with the pick held at 45o, we can strike two strings while going up and one string while going down; and finally, we have the rest stroke: when the pick, held at 45o, strikes two string and stops against the next strings. It's not as confusing as it sounds when you just read it, don't worry! « * Regle de la plume, dans les différens mouvemens. Le coup de plume, que l'on donne, en bas, en couchant un peu la plume, touche les deux cordes, celui en haut, en relevant un tant soit peu la plume, ne touche qu'une corde des deux; ensorte que le coup d'en bas est plus fort que celui d'en haut. Il en résulte que la premiere note du tems doit être en bas; et, si on la faisait en haut, on se gêneroit, et l'on feroit la brève pour la longue, et la longue pour la brève.» Good luck translating that with Google, it's old French! Read below, I roughly did the job. The great novelty about Artist Works schools is the possibility to use their video exchange program. When you're satisfied with the way you play a piece from a lesson, you can record it in video and send it to your teacher; your teacher will then send you back a feedback video. And then those videos can be posted on the website for other students to learn from. So, before you record your video, you can watch what others did and what your teacher said about their performance. It's a great new way of learning. But let's be clear: the video exchange is optional. If someone doesn't feel comfortable with video recording, there's no obligation to participate. On the other hand, it offers precious interaction with the teacher. Video exchange also give to new students the opportunity to submit a placement video to get a first evaluation of his abilities. By sending a first video, the teacher can evaluate the student's level of skills and recommend the best way to pursue his learning. Of course, some little things could be improved. There is no table of content or index to help us rapidly find a lesson. Sometimes, the progression from one lesson to the other is a little hasty: we must try to master a complex technique or a part of a technique while learning a single piece. We must look elsewhere to find ways to complete our learning: personally, I use the Mandolin Companion from Alison Stephens and Chris Acquavella (Read The mandolinist's best friend) or another good mandolin method. And, finally, the labeling Beginner / Intermediate / Advanced is pedagogically not a really good idea: many pieces that are labeled "Beginner" are not that easy: come to my mind certain Allemandes from Leone and Preludes from Marlo Strauss. But, most of all, this way of labeling prompts students to force the pace. Nobody likes to consider himself a "Beginner" for more than half his learning period. Yes, from the 191 lessons, 100 are labeled "Beginner". We can see in several videos that some students go too fast in order to get out of the "Beginners" section. It's very tempting, believe me! When considering it overall, this doesn't undermine the value of this great tool. Of course, online lessons will never replace the relationship we can develop face-to-face with a teacher. But these lessons are a really good addition to any musical training. 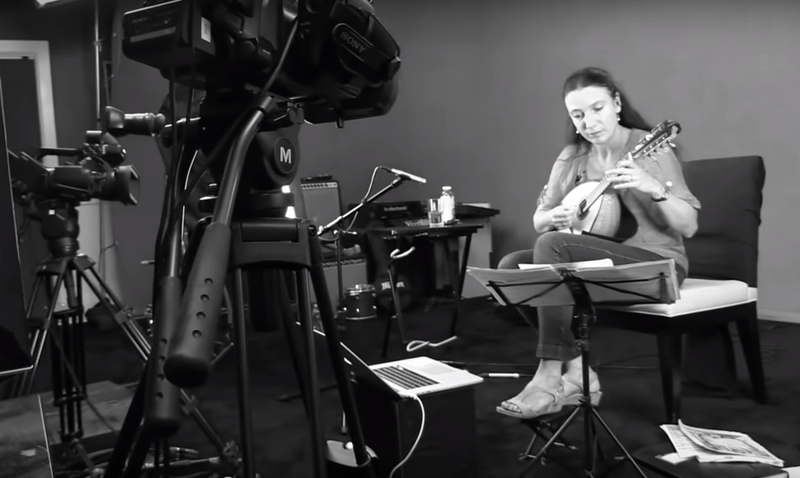 Most of all, it gives us the opportunity to work with one of the greatest mandolinists in the world, Caterina Lichtenberg. * "Rules for the pick (plume) in different movements. The pick downstroke that we give while tilting the pick a little, touches both strings, and the upstroke, touches only one of the two strings; this way, the downstroke is louder than the upstroke. This way, we must play the first beat with a downstroke; if we ever play this first beat with an upstroke, it's a mistake because it's playing the short note where a long one is needed, and a long one where we need a short." Older PostMandolin: Technique or not… zat is ze Question.